In this new age of social search, businesses in any niche rely on different formats of content and content marketing has emerged as more than just a fad to one of most crucial element in digital marketing. According to the statistics, 75% of business rely on content for marketing and promotion. Blogs, presentations, inforgraphics an e-book etc. are some of the formats of content that are used by many businesses. Content marketing not only increases engagement with the targeted audience but also generates the inbound traffic to your site. Like every business has different demographics their content marketing strategy also includes different types of platforms. It is on the business to decide which content sharing platforms suit best to them. Creating content has become a practice for the marketers to promote their business. Research suggests that content marketing on document sharing and presentation sharing sites could work for any type of business to promote their products and services on social media. 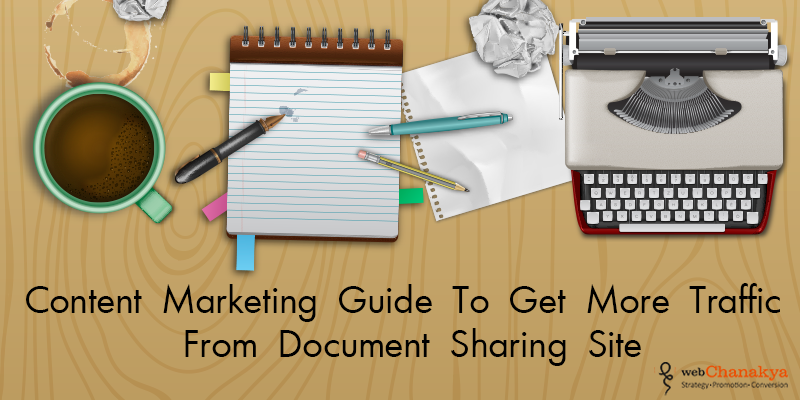 Many online businesses utilize the document sharing sites like one of the content submission. Sites like SlideShare, DocStoc, Issuu, Scribd have become quite popular in Search Engine Optimization (SEO) circles for the purpose of getting exposure for a business or product offer. Document sharing sites have high Page Rank (PR) and Alexa so building the backlinks on these sites will certainly bring you exceptional links that will enhances your ranking on search engines. Sharing the content on these sites not only prolongs the lifespan of your content, but offers a new medium to present your ideas and for presenting your ideas and pulls the attention of potential subscribers. It not only increases the value of your content, but also allows you to publish the content to a wider population in order to increase the traffic on your website. Though, many brands do not use these site to the fullest potential, whereas all you need to do is upload content without any promotion and generate thousands of views, drive traffic to your sites and move your business to another level. Here, we are going to patch up all the discrepancies in your content marketing strategy with certain tips that will increase your social media traffic and accelerate your business. Prior to start creating content, you need to make a plan which will include the details of the topic, you need to know the topic inside out. You should know who would be the target readers. You need to select your industry sector carefully; it will decide your target audience. Before uploading the content in any format, be it word file, pdf or slide deck you need to understand that users of these sites are generally very knowledgeable in their sector, so they would expect to pertain lesser-known and relevant information when they read through the content. It’s no secret how important is content nowadays. Content is vital to get traffic from such sites. You have to be sure that the content is informative and extremely interesting, easy to understand and with convincing explanations. Always aim to capture the main points in just a few short sentences, with each page or slide containing a single point or subject. You should also ensure that you use key words in the content, in the similar way you use them in your blogs. Content is extremely important, but after that you should need to devote time in making the presentation look compelling, and visually impressive, beautiful slides will make your business look professional and tends to attract more readers. Create compelling slides, with right content and call-to-action. Adding a call-to-action to your cover slide is critical if you want to drive clicks to your site because, it is suggested that 90% of audience will not click beyond slide 15. While creating your presentation deck, be concise and use good graphics. It is important that you take time to put your best forward. If you don't have a large audience to reach via your own blog, make sure you clout the power of guest blogging to generate more clicks and shares of your content that you are sharing on these sites. While this strategy works for all of your past shared content, you need to create buzz for your new content as well, it is one of the best ways to hit it right off on your homepage. This will increase your chances of generating more views which will in turn boost your probabilities of getting featured on these site’s homepage. Remember that you can also embed your slides or content with a video, and have a single presentation featured on multiple sites. After all the pain of creating an awesome and visually impressive content, you would definitely want to get the attention of your audience. If you don’t take deliberate actions to turn SlideShare or DocStoc’s attention into your blog, then the visitors of your deck will become just another asset that makes no effect. Directing visitors to your blog means you require to strategically embed links in your slide deck or word file. If you give people the opportunity to connect with you, some will reach out. Linking to your social profiles and main website will give viewers the opportunity to connect with you directly outside of these sites. The best way is to offer a lead magnet on your blog is by either using a custom page type in WordPress, or a hosted service that incentivize your viewers to leave their details. Uploading your presentation and giving it the right metadata is only half the battle. To successfully drive traffic to your blog you need to adhere to one principle; organic traffic through these document sharing and presentation sharing sites is impressive, but you’ll need to drive visitors to them via traditional promotion. The best place to embed your SlideShare presentation is within the original blog post. You can also add links to let readers share your presentation directly. By clicking the ‘Share’ button on the main page of your profile on these sites, you can channelize the attention of the visitors to the embedded links. It is advisable that you regularly monitor if the different formats of content bring you the required traffic. You also need to check which type of content drives most of the traffic. After getting the statistics you would know what your readers are interested in and what they generally prefer to read. So you will focus on compiling the content to keep the traffic gradual on your website. There are many strategies to improve your business’ SEO. Creating original content like a blog, presentation eBook or infographics are some of the ways. When you're uploading a slideshow to SlideShare, a document to DocStoc or a pdf file to Scribd, you have the power of its domain at your disposal. Google rewards frequent and popular postings, as well as frequently-linked websites. Creating con tent on such sites is a great way to increase your business’ online profile. You’ll be more frequently found in Google search, increase traffic to your website, and increase your reputation as a source of information. If you’re tired of seeing meager results from your content efforts, this is where the document sharing and presentation sharing platforms come into play. They are an exceptional platform for traffic-hungry bloggers and marketers, and are flexible enough to work efficiently with your current efforts. Begin with the content, contacts and resources you already have. Then put in all the efforts in creating visually impressive content or slides to see how they generate leads and drive traffic in result. It is definitely not a matter of overnight, it will take its own time, if used in the right manner, gradually these sites will bring you immense traffic. Like all other primitive social networks, these help you to build a trusted audience who are actually interested in what you have to offer.